Ourpets Smartscoop Intelligent Litterbox 27 Inch X 17.25 Inch X 7.75 Inch. 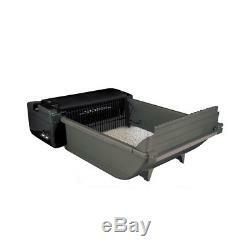 The SmartScoop ® Intelligent Litter Box uses infrared technology to sense when your cat enters and exits the box and engages the scoop mechanism accordingly; scooping the waste into a waste bin and keeping the litter box clean. The litter boxs monitoring features; which are sent via Bluetooth® to the IntelligentPetLink TM smartphone app; report: Elimination behavior; frequency & duration Litter box maintenance i. Bluetooth® health monitoring system Automatically scoops waste Superior odor control Easy to clean Works with any clumping cat litter. Pictures are for Reference only please read the Description Thoroughly. Your Happiness is our Main Concern. The item "Ourpets Smartscoop Intelligent Litterbox 27 Inch X 17.25 Inch X 7.75 Inch" is in sale since Thursday, November 24, 2016. This item is in the category "Pet Supplies\Cat Supplies\Litter Boxes". The seller is "kanadaforsale" and is located in Sweet Grass. This item can be shipped to United States, United Kingdom, Denmark, Romania, Slovakia, Bulgaria, Czech republic, Finland, Hungary, Latvia, Lithuania, Malta, Estonia, Australia, Greece, Portugal, Cyprus, Slovenia, Japan, China, Sweden, South Korea, Indonesia, Taiwan, South africa, Thailand, Belgium, France, Hong Kong, Ireland, Netherlands, Poland, Spain, Italy, Germany, Austria, Israel, Mexico, New Zealand, Philippines, Singapore, Switzerland, Norway, Saudi arabia, Ukraine, United arab emirates, Qatar, Kuwait, Bahrain, Croatia, Malaysia, Brazil, Chile, Colombia, Costa rica, Dominican republic, Panama, Trinidad and tobago, Guatemala, El salvador, Honduras, Jamaica, Antigua and barbuda, Aruba, Belize, Dominica, Grenada, Saint kitts and nevis, Saint lucia, Montserrat, Turks and caicos islands, Barbados, Bangladesh, Bermuda, Brunei darussalam, Bolivia, Ecuador, Egypt, French guiana, Guernsey, Gibraltar, Guadeloupe, Iceland, Jersey, Jordan, Cambodia, Cayman islands, Liechtenstein, Sri lanka, Luxembourg, Monaco, Macao, Martinique, Maldives, Nicaragua, Oman, Peru, Pakistan, Paraguay, Reunion.